Suitable for detection of total antioxidant capacity in serum and food extracts. For research use only. Oxidative stress plays on important role in various diseases and aging. The control of oxidative stress is expected to be useful to prevent diseases and aging.Oxidative stress is caused by the imbalance between reactive oxygen species (ROS) and antioxidant defense system. For accurate assessment of oxidative stress, measurement of ROS, oxidative damage and antioxidant activity may be essential. Recently, antioxidants as functional foods which scavenge ROS attract a great deal of attention. 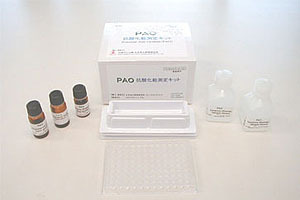 In the PAO assay kit, an easy and convenient method to measure antioxidant capacity is provided. Utilizing the reduction of cupric ion (Cu++ to Cu+), antioxidant capacity of samples can be detected in 5 minutes. Samples are mixed with Cu++ Solution. 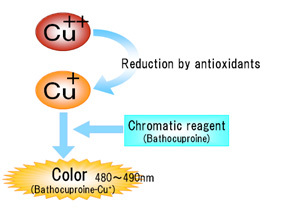 Cu++ are reduced by antioxidants to form Cu+. Reduced Cu+ react with Chromatic Solution (Bathocuproine) , and can be detected by absorbance at wavelength 480 to 490 nm. Antioxidant capacity can be calculated from the Cu+ formed. PAO can detect not only hydrophilic antioxidants such as Vitamin C, glutathione, but also can detect hydrophobic antioxidants such as Vitamin E. Applicable for assessment of total antioxidants of serum, foods and beverage samples. Applications: Human and animal serum samples, foods and beverage samples. NaOH, HCl solution and pH meter (Not required if standards are prepared with distilled water only). 1) Prepare 6 levels of standards by diluting 2mM uric acid. 2) Please prepare plastic test tubes for 6 levels of standards and each sample. 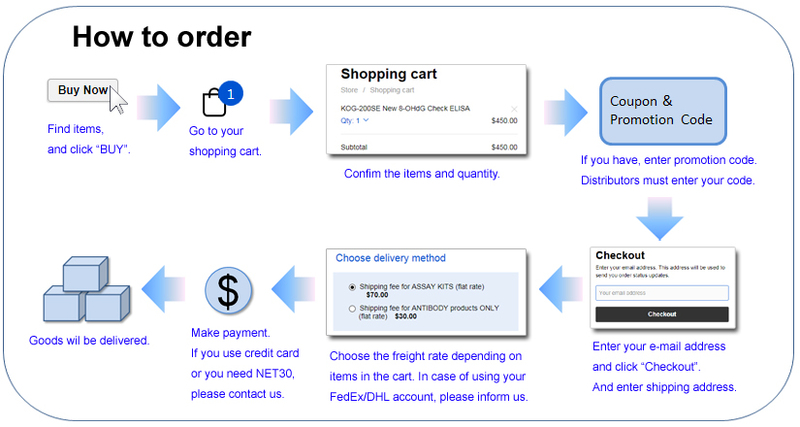 Pour 390 µL of Sample Diluent, and add 10 µL of standards or diluted samples. 3) Pour 200 µL of mixture to Micro titer plate. Use 200 µL of Sample Diluent for blank well. 4) Read absorbance at 490 nm (as READ1). 5) Add 50 µL of Cu++solution to each well, mix gently, and incubate at room temperature for 3 minutes. 6) Add 50 µL of Stop solution, mix gently, and read absorbance at 490 nm (as READ2). 7) Please draw standard curves by plotting the difference of absorbance readings (READ2 - READ1) as vertical axis, and concentration of uric acid standards (mM) as horizontal axis. Calculate the corresponding uric acid concentration of samples. 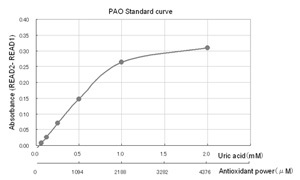 Multiply corresponding uric acid concentration (mM) of samples by 2189, to estimate antioxidant power (µmol/L). 4) Vitamin E-coated dialyzers reduce oxidative stress related proteins and markers in hemodialysis ? a molecular biological approach. 5) Oxidative stress-related factors in Bartter's and Gitelman9s syndrome: relevance for angiotensin IIsignalling. 6) Effect of epoetin on HO-1 mRNA level and plasma antioxidants in hemodialysis patients. 7) Restored Antioxidant Capacity Parallels the Immunologic and Virologic Improvement in Children with Perinatal Human Immunodeficiency Virus Infection Receiving Highly Active Antiretroviral Therapy. Related patent: US PAT.6613577, JP PAT.5917951.